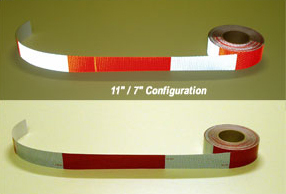 This 5-7 year rated conspicuity tape exceeds all State and Federal NHTSA & DOT requirements. The rolls on this page have the 7″ white / 11″ red alternating pattern. The Reflexite rolls have the DOT-C2 logo imprinted on them. The tape is easy to apply. Just peel off the backing and apply to a clean, dry surface then apply pressure using a squeegee or soft cloth. 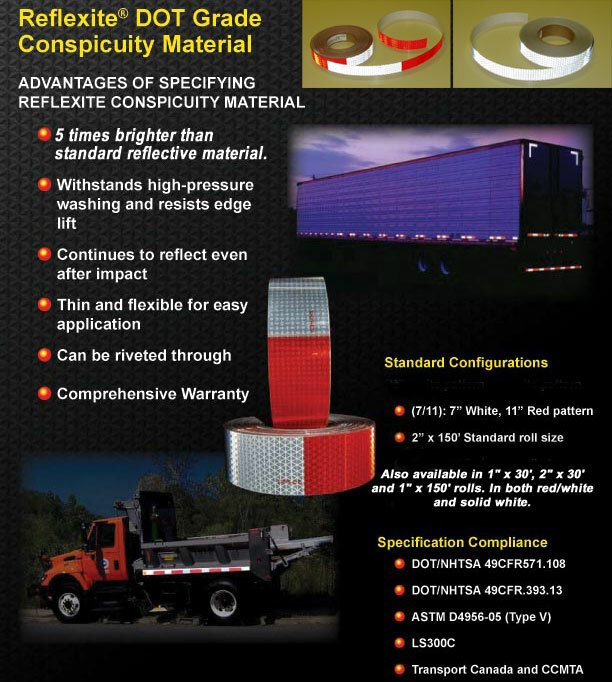 2″ rolls are certified to be used in DOT applications as well as other applications such as personal trailers, gates, fences, guard rails, non DOT regulated vehicles, bicycles. On this page we carry the Reflexite 7/11 V92 rolls in 2 inch rolls. You can purchase both 30 foot and 150 foot rolls by clicking the buttons below. Kiss cut rolls are also available. (KISS CUT rolls are continuous rolls where the tape has been precut or scored down to the liner. Think of it as 18″ pre-cut strips on a roll.) We normally ship out the rolls the day they are ordered. If you need expedited shipping or need any assistance you an call us at 850-934-3157.